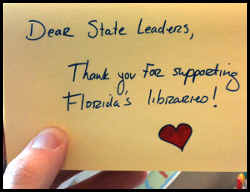 Great news for Florida's libraries: The Florida House and Senate budget chairs agreed to fund State Aid to Public Libraries at $21.3 million, a slight increase over last year. The Jacksonville Public Library depends on State Aid to fund some of what the City General Revenue Fund does not cover. In addition, federal funds we rely on for literacy programs are contingent upon the State Aid appropriation. Take the Survey! Show Some Love! Just a reminder: There's still time to click over to the City of Jacksonville website and take part in their Public Libraries Survey. Your feedback will help the mayor and his staff prepare a suggested budget for the incoming city administration. By letting city officials know how important the Jacksonville Public Library is to you and your community, you can help make adequate library funding a priority in the City's budget! EDIT: State Aid for Public Libraries was approved by Senate and House Budget Chairs at $21.3 million–an increase of $100,000 over the current year. Click here to send a thank-you note to legislators and leaders! Although National Library Week comes around once a year, our customers and communities demonstrate their ongoing support of the Jacksonville Public Library on a daily basis. Thanks to you, every week at JPL is National Library Week. However, looming city budget cuts to the tune of $6 million threaten to drastically reduce our ability to provide essential library services. On Tuesday, we honored the winners of the biennial Design a Bookmark Contest during a ceremony at the Main Library. This year's theme was "Our World, Our Words, Our Future" and the winning bookmarks will be reproduced and distributed to library locations. Visit our Flickr page to browse pictures from the ceremony. Below, you'll find just a sample of the positive feedback we've received from our customers and visitors. Young and old, from all corners of Jacksonville and from many nations around the world--our customers rely on us as a vital community resource. Click here to discover more about our value in your home and take a moment to tell us why we matter to you. Then, contact your City Council member to let him or her know just how much you value your library!